Her mouth is small for silent recollection. Her long nose, small mouth and gently pursed lips and the dark color of her garments give her whole figure a sacred grandeur that penetrates to the very heart of the viewer and of the mystery that she herself appears to contemplate as she gazes out. Excerpted from The Perpetual Help Story, Liguori Publications, 1976; and The Story of an Icon by Fabriciano Ferrero, Redemptorist Publications, 2001. 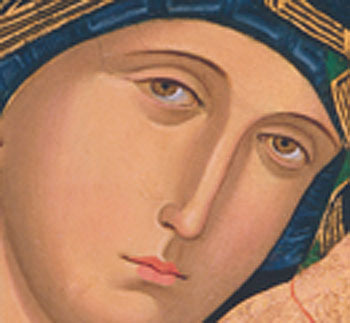 Mother of Perpetual Help, your very name inspires confidence. We come before your holy picture in praise and thanksgiving to God, seeking your intercession with Jesus, your Son, for all the needs of our lives today. You answered when called to be mother of our Lord. You wondered as your Son grew in wisdom, knowledge and grace. You are the first of all the disciples and saints. We trust in your motherly love and care. Obtain for us all the graces we need to fulfill God’s plan each day of our lives.